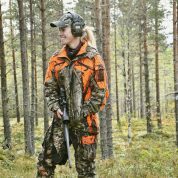 Multi talented huntress from Northern Sweden who got the outdoors on her mind 99% of the time. Being an ‘outdoor-girl’ both in real life and on social media, I can really relate to the notion that it’s time for women to start celebrating ourselves a lot more. Article in collaboration with Kari Traa. Though I don’t want to admit it, there’s always been an ‘ideal’ within my interests of hunting and fishing and sometimes it can be a bit more difficult to just be proud of what I can do and how much I’ve learned over the past few years. Women entering sports which were once thought of as a man’s world can be intimidating. But female hunters and fishermen are no longer a mystery in this world. Ladies, instead of comparing ourselves and our accomplishments to one another and to men’s, we should all stay together. We should encourage other hunters, fishers and all others who share the same outdoors interests that we do. I’m happy to be able to tell people I’m part of this huge outdoor family and I’m super happy seeing more girls entering this great world of hunting and fishing. May that never stop! We can do it and don’t let anyone tell you any different. Celebrate yourself and stay proud girl! I’ve been working with the Norwegian sports brand Kari Traa who have launched a new campaign encouraging us girls to celebrate ourselves more, to stop comparing us to others and to be proud of our own goals, what we can accomplish and who we are. Kari Traa is for the winners, the finishers but also for the quitters. For the elite, the amateurs and the wannabes. In short, Kari Traa does not distinguish between a good and a bad performance.